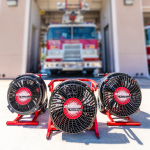 Last year, at FDIC, RAMFAN showed the EX50Li and its wheel kit—a ventilation fan with swappable Li-ion battery packs PLUS an easy-to-use wheel-kit to help make tough situations easier for the user. What will RAMFAN impress us with this year? You can find us at booths, #3121 and #3017 at FDIC International 2019 to see what is new!